It's been a while since I've done a restaurant review and I figured that this place is totally worth it. Sacred Chow, located in Greenwich Village, is a Kosher, Vegan, and Organic restaurant with Gluten-free options as well! I went here for the first time two weeks ago not really knowing what to expect. A friend told me about her experience here earlier that day so I figured that I'd give it a shot. I went in around 5 p.m. on a Saturday night and had the place to myself. I like eating in NYC alone sometimes because no one really pays attention to it or judges you like they do in my hometown. Anyways, this place is really cute inside. It's bright enough, but not too bright like so places I've been to. The decor is really nice as well. I didn't know what to get and it took me forever to decide. But I finally chose the Grilled Nama Gori sandwich with almond feta and sunflower seed meat and it came with smoky home fries as well. The almond feta and sunflower seed meat were both okay. I enjoyed them but they weren't something that I'd probably get again. That also might be because I ate them after the sandwich and my taste buds were biased. Who knows. The smoky home fries were great as well, but once again; huge serving. I couldn't finish all of them and I was pretty sad about that because they were really good. My server that night was a younger guy and he was very attentive and helpful with all of my questions. They played great music as well! But do you want to know what the best part was? This only cost me $10! Then this past weekend I ended up at Sacred Chow again, this time with my friend. We were there on a Saturday morning so we were able to order off the brunch menu which I was pretty excited about. 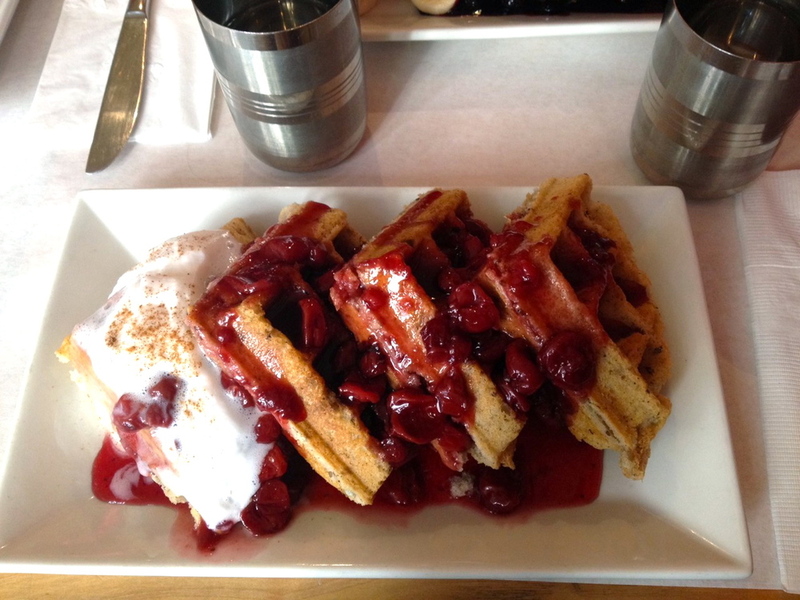 I got the Belgium Waffle which was topped with a cherry compote, coconut whipped cream, and a razzle-dazzle raspberry drizzle. I about screamed when I saw that the waffle was gluten free. That is just unheard of where I live, so very sadly. Anyways, we ended up having the same server that I had the previous week and he was great once again. The waffle was even better. They topped it with just enough cherries, whipped cream, and drizzle. You know how sometimes restaurants skimp out on giving you the good stuff? Well this place shares the glory. And once again, I was really full from this waffle, but ate the whole thing and savored every moment because how often do things like this come into my life? Not that often unless I'm making it myself. Oh, and do you want to know the best part about this trip there? This only cost me $10 too.